Has three children: Willy Jr., Mila and Gabriel...Attended Cenapec High School in Santo Domingo, D.R. Played for both the White Sox and Class AAA Charlotte … appeared in his first career major-league games...Made 17 appearances (12 starts) in right field, 13 (eight) in left and 11 (nine) in center … served as the designated hitter in two games and was a pinch hitter in three contests...Ten of his 25 hits went for extra bases...Was recalled from Class AAA Charlotte on 4/14, replacing Melky Cabrera (Paternity List) on the 25-man roster … doubled in his first at-bat in the second inning for his first MLB hit...Joined Avisaíl García (right field) and Leury García (center field) as the starting outfield on 4/14, marking the first time in MLB history a starting outfield included three players with the exact same last name (Elias)...Was optioned back to Charlotte on 4/16, making room for Cabrera's return to the 25-man roster...Was recalled from the Knights on 5/2, replacing Jacob May on the 25-man roster … at the time of his promotion, ranked among the International League leaders in home runs (T5th), OPS (8th, .924), walks (T10th, 11), slugging percentage (11th,.529) and on-base percentage (12th, .395)...Hit his first career home run on 5/20 at Seattle, a solo shot off LHP Dillon Overton...Recorded his first career multihit effort on 6/12 vs. Baltimore... Was optioned to the Knights on 7/10 and recalled a third time on 7/27, replacing Avisaíl García on the active roster...Left the game in the sixth on 7/31 vs. Toronto after colliding with Yoán Moncada while attempting to catch a pop up in right field … was placed on the seven-day concussion list on 8/1...Was sent on a rehab assignment to Class A Kannapolis on 9/7 and appeared in five games … was returned from the Intimidators and reinstated on 9/15...Was cited by Baseball America as possessing the Best Outfield Arm in the International League... Appeared in 31 games in his first season with Charlotte … made 20 starts in right field, seven in center and one in left...Hit safely in each of his first six games of the season, including four multihit efforts … homered in consecutive games from 4/8-9. Spent the entire season with Class AAA Indianapolis and was named the Indians' Defensive Player of the Year. Led International League outfielders with a career-high 128 games played and 17 assists. Compiled a .970 fielding percentage … made all 128 defensive appearances (124 starts) in right field. Hit .316 with nine doubles and 12 RBI over 27 June games … compiled a 12-game hitting streak from 6/3-15, going 21-48 (.438) with seven doubles and eight RBI. Homered just once in his first 81 games (4/16 at Durham) before homering in back-to-back games from 7/8-9. Entered the season rated by Baseball America as Possessing the Best Outfield Arm in the Pittsburgh system. Appeared in 23 games for Estrellas de Oriente in the Dominican Winter League. Was rated by Baseball America as having the "Best Outfield Arm" in the Pirates minor league system prior to the season...Split season between Double-A Altoona and Triple-A Indianapolis and hit .275 (132-for-480) with 18 doubles, six triples, 15 home runs and 67 RBI in 124 total games...Ranked second among all Pittsburgh minor leaguers in home runs behind Stetson Allie (17)...Began season with Altoona, where he made 38 appearances in left field, 11 in center field and six in right field...Hit two home runs on 6/3 vs. New Britain and hit each of his first three homers off New Britain's RHP Bryan Evans...Was on a team-best 19-game hitting streak, hitting .377 (30-for-81) with five home runs, 16 RBI, 12 runs scored and three walks, when promoted to Indianapolis on 6/15; it was tied for the secondlongest hitting streak in Altoona franchise history...Hit eight of his 10 Triple-A home runs and knocked in 24 runs in 28 games during the month of August... Homered in three straight games from 8/1-3...His 10 home runs following the Triple-A All-Star break were tied for third-most in the International League... Made 47 appearances in right field, 13 in center field and eight in left field while playing with Indianapolis...Had a total of 18 assists between the two teams (9 in LF/7 in RF/2 in CF)...Appeared in 26 games with Aguilas during the Dominican Winter League. Entered season ranked by Baseball America as the 14th best prospect in the Pirates farm system...Spent entire season with Double-A Altoona... Named to 2014 Eastern League All-Star Team and participated in "Ghostman Games & Hitting Challenge" on 7/15 and gave the West Division a victory after scoring 13 runs (22-21 West)... Made 103 appearances (100 starts) in right field, 19 appearances (18 starts) in left field and two appearances (one start) in center field...Established club record with 19 outfield assists (previous mark of 18 was set by Starling Marte in 2011)...Had 15 assists from right field and four from left field...Posted minor league career highs in games, hits and doubles...Tied his career high for home runs...Established a franchise record for strikeouts...Was the Opening Day right fielder...His first hit was a walkoff home run on 4/8 vs. Akron that gave the Curve a 4-3 victory...Fell a home run shy of hitting for the cycle on 4/24 vs. Harrisburg...Hit a pair of home runs on 5/22 vs. Akron...Tied career high with five RBI on 6/3 vs. Binghamton... Homered twice again on 6/30 at Bowie...Hit .313 with five home runs and 15 RBI in June...Was the starting left fielder in the Eastern League All-Star Game and went 1-for-2...Made first start in left field with Altoona on 7/17 vs. Bowie when Josh Bell was promoted from Bradenton...Matched career high with a 13-game hitting streak from 7/21 to 8/2 (24-for-52, .462)...Finished July with a .319 batting average...Batted .378 (14-for-37) during an 11-game hitting streak from 8/14-26...Played in the Dominican Winter League and hit .269 (35-for- 130) with 13 doubles, four home runs and 18 RBI in 38 games with Aguilas. Entered season ranked by Baseball America as the 18th best prospect in the Pirates farm system...Spent entire season with High-A Bradenton, where he made 113 starts in right field and two in center field...His 20 assists (19 RF/1 CF) were the most among any outfielders in the organization and in the Florida State League...Ranked fifth among Pittsburgh minor league players in home runs...Went 6-for-6 at St. Lucie on 6/24, setting a Marauders franchise record for most hits in a game...Batted .308 (28-for-91) in June and July...Hit .400 (20-for-50) during a career-best 13-game hitting streak from 7/21 to 8/10, raising batting average from .247 to .266. Spent entire season with Low-A West Virginia...Led all Pirates farmhands in home runs and ranked fourth in RBI...Set minor league career highs in at bats, home runs and RBI...Made 58 appearances (57 starts) in left field and 56 appearances (55 starts) in right field...Recorded 12 assists - eight from left field and four from right field...Went 3-for-5 with a pair of RBI in his first game with the Power on 4/5 at Hagerstown...Hit first home run on 4/13 vs. Greenville...Hit safely in nine of his 11 games from 4/26 to 5/7, raising average from .169 to .240...Batted .301 with four home runs and 16 RBI in May...Had a career-high five RBI on 8/30 at Delmarva...Homered twice on 8/20 in a 9-2 victory over Charleston (SC)...Went hitless in his last 20 at bats... Played in two games with Aguilas during the Dominican Winter League. Spent majority of season with the Gulf Coast League Pirates...Made 25 appearances (24 starts) in center field, 21 starts in right field and one start in left field...Had eight assists (6 RF/2 CF)...Began campaign with three hits and two stolen bases on 6/20 at GCL Blue Jays...Hit .313 with two home runs, 16 RBI and a .567 slugging percentage in July...Hit safely in his final four games with the GCL Pirates before being promoted to short-season State College on 9/2 for final three games...Went 2-for-4 in his only start with Spikes in final game on 9/4 at Williamsport. Began professional career with the DSL Pirates...Made 24 starts in left field, 21 in right field and two in center field...Had 11 assists (7 LF/4 RF)...Went 2-for-5 with double as the designated hitter while making his debut on 5/29... Hit safely in 10 of his first 12 games...Batted .303 with 14 RBI in June...Hit his first professional home run on 7/11. 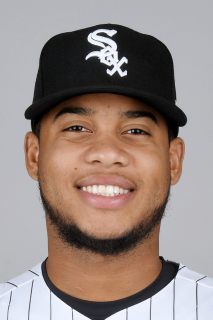 January 8, 2019 OF Willy Garcia assigned to Leones del Escogido. December 11, 2018 Tiburones de La Guaira signed free agent OF Willy Garcia. October 13, 2018 OF Willy Garcia assigned to Leones del Escogido. March 9, 2018 Chicago White Sox released RF Willy Garcia. October 20, 2017 OF Willy Garcia assigned to Leones del Escogido. September 15, 2017 Chicago White Sox activated RF Willy Garcia from the 10-day disabled list. September 7, 2017 Chicago White Sox sent RF Willy Garcia on a rehab assignment to Kannapolis Intimidators. August 10, 2017 Chicago White Sox placed RF Willy Garcia on the 10-day disabled list. Concussion. August 1, 2017 Chicago White Sox placed RF Willy Garcia on the 7-day disabled list. Concussion. July 27, 2017 Chicago White Sox recalled RF Willy Garcia from Charlotte Knights. July 10, 2017 Chicago White Sox optioned RF Willy Garcia to Charlotte Knights. May 2, 2017 Chicago White Sox recalled Willy Garcia from Charlotte Knights. April 17, 2017 Chicago White Sox optioned RF Willy Garcia to Charlotte Knights. April 14, 2017 Chicago White Sox recalled Willy Garcia from Charlotte Knights. March 15, 2017 Chicago White Sox optioned RF Willy Garcia to Charlotte Knights. January 6, 2017 Chicago White Sox claimed Willy Garcia off waivers from Pittsburgh Pirates. December 31, 2016 Pittsburgh Pirates designated RF Willy Garcia for assignment. October 20, 2016 OF Willy Garcia assigned to Estrellas Orientales. October 3, 2016 Pittsburgh Pirates recalled RF Willy Garcia from Indianapolis Indians. March 18, 2016 Pittsburgh Pirates optioned RF Willy Garcia to Indianapolis Indians. October 16, 2015 OF Willy Garcia assigned to Aguilas Cibaenas. October 8, 2015 Willy Garcia roster status changed by Pittsburgh Pirates. October 5, 2015 Pittsburgh Pirates recalled RF Willy Garcia from Indianapolis Indians. June 15, 2015 RF Willy Garcia assigned to Indianapolis Indians from Altoona Curve. March 19, 2015 Pittsburgh Pirates optioned RF Willy Garcia to Altoona Curve. January 28, 2015 OF Willy Garcia assigned to Dominican Republic. November 20, 2014 Pittsburgh Pirates selected the contract of Willy Garcia from Altoona Curve. March 29, 2014 RF Willy Garcia assigned to Altoona Curve from Bradenton Marauders. February 28, 2014 OF Willy Garcia assigned to Pittsburgh Pirates. April 2, 2013 OF Willy Garcia assigned to Bradenton Marauders from West Virginia Power. March 8, 2013 LF Willy Garcia assigned to Pittsburgh Pirates. December 2, 2012 OF Willy Garcia assigned to Aguilas Cibaenas. April 4, 2012 Willy Garcia assigned to West Virginia Power from State College Spikes. March 8, 2012 OF Willy Garcia assigned to Pittsburgh Pirates. September 2, 2011 Willy Garcia assigned to State College Spikes from GCL Pirates. December 31, 2010 DSL Pirates released OF Willy Garcia. May 28, 2010 OF Willy Garcia assigned to DSL Pirates from VSL Pirates. May 18, 2010 Pittsburgh Pirates signed OF Willy Garcia. May 18, 2010 Willy Garcia assigned to VSL Pirates from Pittsburgh Pirates.